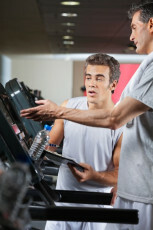 The question of whether or not to offer unsolicited advice at the gym is a simple one. Unfortunately, the answer is less simple. If you have pondered whether you should or shouldn’t help a stranger correct their form the unhappy news about the best answer is, it depends. How do you pick the person you will ask for directions or the time? Often you decide based only on an undefined feeling that leads you to choose one person over another. This also holds true about offering advice in the gym; start with your gut. Try to gauge the person’s receptivity before you break in on their ill formed routine. Your advice may be more welcome if the person seems new, hesitant or unsure about what he or she is doing. Such a person may make eye contact with you or seem to watch the movements and form of fellow gym goers. You may also recognize a candidate open to correction if you have seen this person working with a trainer. That often signals that the person is learning something new and probably open to feedback. The best kind of advice about form is accurate and in-depth enough to explain the benefits of improved mechanics. Most people are put off by a know it all attitude. Avoid making the person you are trying to help feel like a loser. Begin by talking about what you notice is good about their form and follow up with any adjustments that have worked well for you. Don’t forget about the “what’s in it for me” hook. Be sure your advice or correction includes anticipated benefits, such as improved isolation or targeting of a particular muscle or avoidance of injury. Offering advice you haven’t been asked for is not without risks. Maybe the person you want to help will be angry or offended, but maybe not. Before you begin be sure that your intention is to be helpful rather than critical. If the opportunity presents itself try to initiate a dialogue that lets your “student” share some tips or advice with you. Don’t take a less than positive response personally. Finally, if you sense danger speak up quickly and gently. Helping someone avoid injury is worth the risk. If your genuine intention is to be helpful and your head is bitten off, don’t worry, you still get to add points to your karmic score sheet.